I think the best way to start the week off is with some sunshine and sparkle. Today's post is my final project that I completed while on vacation in North Carolina. I was lucky enough to work with my friend Bee while in her screened in porch. It was my favorite place in her home. Our plan was simple. Improve an old pair of heels. I found some great instructions from an awesome blog on how to add some sparkle with only a few supplies. 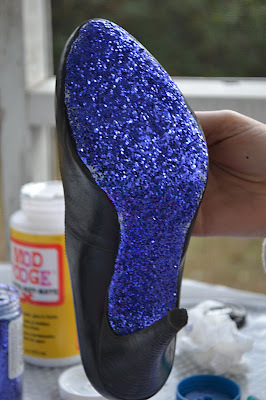 We needed Mod Podge, glitter and shoes. I decided on a pair of plain black pumps from Target. They were cheap enough that I wouldn't be upset if I ruined the shoes. The blogger said she used 1/4 cup of Mod Podge so I just guessed. Next I mixed a large amount of glitter into the Mod Podge. I spread the glitter/Mod Podge mixture all over the bottom of the shoe. Next the instructions said to cover the Mod Podge with dry glitter and spread around with a dry paint brush. That was a little annoying - it would take forever. So I ended up dumping glitter all over the shoe and making a big mess. But it worked well. I sprinkled the glitter all over - making sure I covered every last inch. Next I just had to let it dry overnight. All of those steps were really easy. The only thing I was really unhappy about was the amount of Mod Podge I ruined with glitter that I had left over. I probably had half of the Mod Podge left over. If you attempt this craft - please use way less than 1/4 cup of Mod Podge. Be warned - there will be loose glitter everywhere. The next morning the shoes had perfectly dried. The loose glitter was still loose however. If I knocked the shoes together glitter would fall off. The next step was to apply another coat of Mod Podge. After the Mod Podge had completely dried - I was thrilled with the results. No loose glitter. I don't know how long the shoes will hold up, but I'm quite confident I won't leave a trail of glitter behind me. I love this craft. I had a boring old pair of shoes. Now - I have an exciting pair of shoes! I think I may add another glitter pair of shoes to my collection.